What if you could behave like the crew on the Starship Enterprise and teleport yourself home or anywhere else in the world? As a human, you're probably not going to realize this any time soon; if you're a photon, you might want to keep reading. Through a collaboration between the University of Calgary, The City of Calgary and researchers in the United States, a group of physicists led by Wolfgang Tittel, professor in the Department of Physics and Astronomy at the University of Calgary have successfully demonstrated teleportation of a photon (an elementary particle of light) over a straight-line distance of six kilometres using The City of Calgary's fibre optic cable infrastructure. The project began with an Urban Alliance seed grant in 2014. 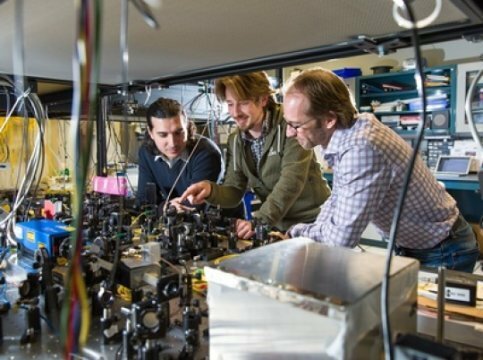 "Such a network will enable secure communication without having to worry about eavesdropping, and allow distant quantum computers to connect," says Tittel. The experiment is based on the entanglement property of quantum mechanics, also known as "spooky action at a distance" — a property so mysterious that not even Einstein could come to terms with it. "Being entangled means that the two photons that form an entangled pair have properties that are linked regardless of how far the two are separated," explains Tittel. "When one of the photons was sent over to City Hall, it remained entangled with the photon that stayed at the University of Calgary." "What happened is the instantaneous and disembodied transfer of the photon's quantum state onto the remaining photon of the entangled pair, which is the one that remained six kilometres away at the university," says Tittel. The research could not be possible without access to the proper technology. One of the critical pieces of infrastructure that support quantum networking is accessible dark fibre. Dark fibre, so named because of its composition — a single optical cable with no electronics or network equipment on the alignment — doesn't interfere with quantum technology. "By opening The City's dark fibre infrastructure to the private and public sector, non-profit companies, and academia, we help enable the development of projects like quantum encryption and create opportunities for further research, innovation and economic growth in Calgary," said Tyler Andruschak, project manager with Innovation and Collaboration at The City of Calgary. "The university receives secure access to a small portion of our fibre optic infrastructure and The City may benefit in the future by leveraging the secure encryption keys generated out of the lab's research to protect our critical infrastructure," said Andruschak. In order to deliver next-generation services to Calgarians, The City has been increasing its fibre optic footprint, connecting all City buildings, facilities and assets. As if teleporting a photon wasn't challenging enough, Tittel and his team encountered a number of other roadblocks along the way. "The challenge was to keep the photons' arrival time synchronized to within 10 pico-seconds," says Tittel. "That is one trillionth, or one millionth of one millionth of a second." Secondly, parts of their lab had to be moved to two locations in the city, which as Tittel explains was particularly tricky for the measurement station at City Hall which included state-of-the-art superconducting single-photon detectors developed by the National Institute for Standards and Technology, and NASA's Jet Propulsion Laboratory. "Since these detectors only work at temperatures less than one degree above absolute zero the equipment also included a compact cryostat," said Tittel. The above post is reprinted from materials provided by University of Calgary. The original item was written by Drew Scherban, University Relations. Note: Content may be edited for style and length.